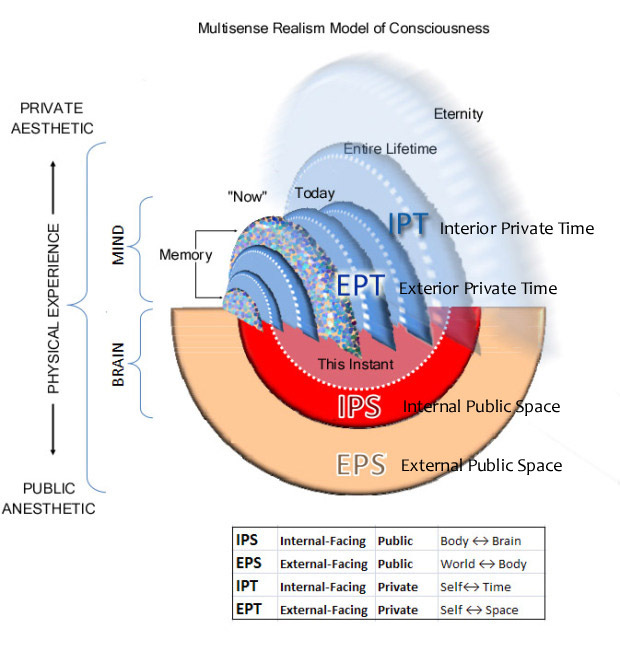 IPT, EPT, IPS, EPS – This diagram attempts to map consciousness from the individual’s perspective. Here, privacy is defined in terms of Interior and Exterior facing time, and the public body is defined in spatial terms of Internal and External exposure. The purpose of the diagram is to show how time exists as multiple wheel-like contexts of varying scale according to the frequency of repeating experiences. It is proposed that part of what individual consciousness does is to fracture space from time so that they are perceptually offset – a fugue of times funnel down to a conditional ‘now’, at which point the sense of ‘here’ becomes a nexus of intersecting ‘there’s.